April 12, 2017. The XXIV International Scientific Conference "Lomonosov-2017" was held at the Lomonosov Moscow State University. Engineer of the Laboratory of Geoinformatics and Geomagnetic Studies of GC RAS A. G. Smirnov made a report "Analysis of global models of the Earth's main magnetic field" in the section "Geology". The presentation aroused great interest among the students and members of the program committee. 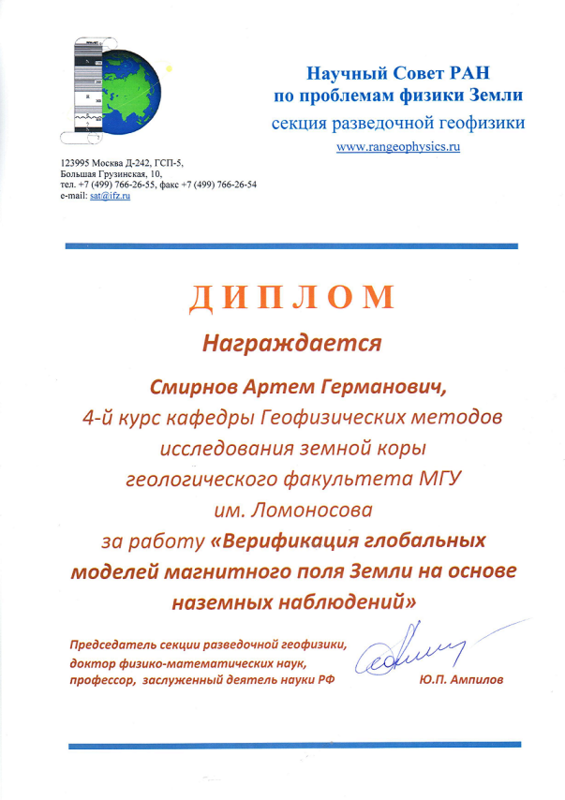 A.G. Smirnov was awarded a diploma of the competition of scientific works of the Geological Faculty of Moscow State University among students, graduate students and young scientists "Report - Publication - Project" for the best report at the XXIV International Scientific Conference "Lomonosov 2017". Deputy Director for Science of the GC RAS , Corresponding Member of RAS Anatoly Alexandrovich Soloviev was the scientific supervisor of this work.